J. S. Bach didn't invent the fugue, but he truly refined the form and used it to take music to new places. "Fugue No. 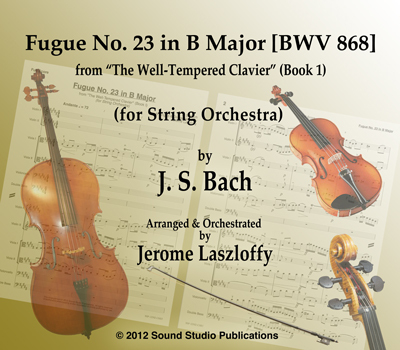 23 in B Major" is a 4-part fugue taken from Bach's "The Well-Tempered Clavier" (Book 1) and arranged & orchestrated for string orchestra by Jerome Laszloffy. This fugue exposes young players to Bach’s genius in composition and counterpoint, as well as teaching the importance of ensemble, solo lines, tone, dynamic contrast and precision bowing. The instrumentation/parts distribution is as follows: 5-Violin 1, 5-Violin 2, 3-Viola 1, 3-Viola 2, 6-Violoncello, 4-Double Bass. "Fugue No. 23 in B Major" [BWV 868] (for String Orchestra) is a GRADE 4 work. The duration is approximately 2:00. The set contains 26 full-sized parts for performers and a bound, conductor's full score. Available only through this website from Sound Studio Publications.